Alexi Campbell’s The Pride was highly successful in interweaving two separate periods of time in order to juxtapose contrasting attitudes in Britain to homosexuality. He attempts something similar here, but unfortunately it does not work nearly so well, despite some excellent acting from a well balanced and integrated cast. The action takes place in Greece on the island of Skiathos, with the first act set in 1967 at the time of the Colonels’ coup, and the second a decade later. The setting is the villa of the title, depicted with impressive realism by Hildegard Bechtler’s design, placed atop a rocky outcrop. 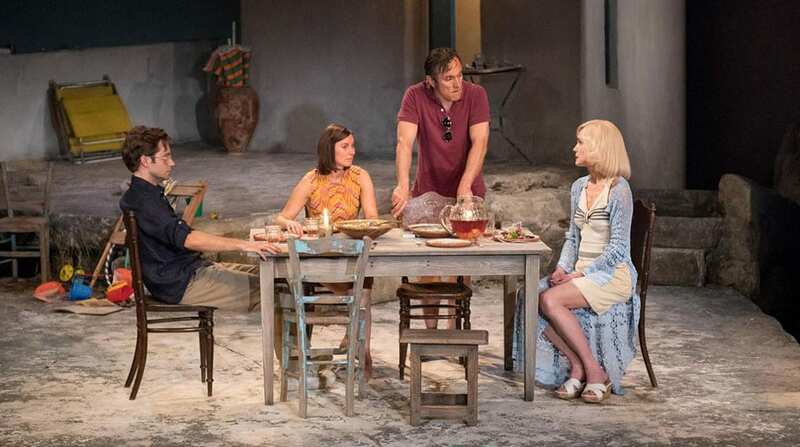 It is essentially the story of two couples: an English pair, Theo and Charlotte (Sam Crane & Pippa Nixon), who have rented this villa for a summer holiday, and two Americans Harvey (Ben Miles & Elizabeth McGovern) they are entertaining , who have more-or-less invited themselves over. 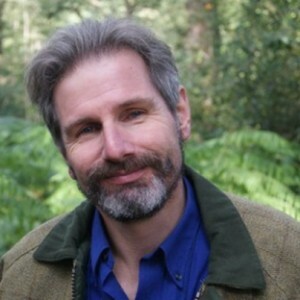 Harvey is the dynamo and motor of the plot: a larger than life CIA operative, he summons up a vision of how the villa can transform the lives of Theo and Charlotte, through providing a location for their children and for Theo’s writing. An opportunity to buy the villa for next to nothing comes along when its owners reveal they need to raise all the money they can to emigrate to Australia. Despite awkwardness and reservations all around the deal is done. 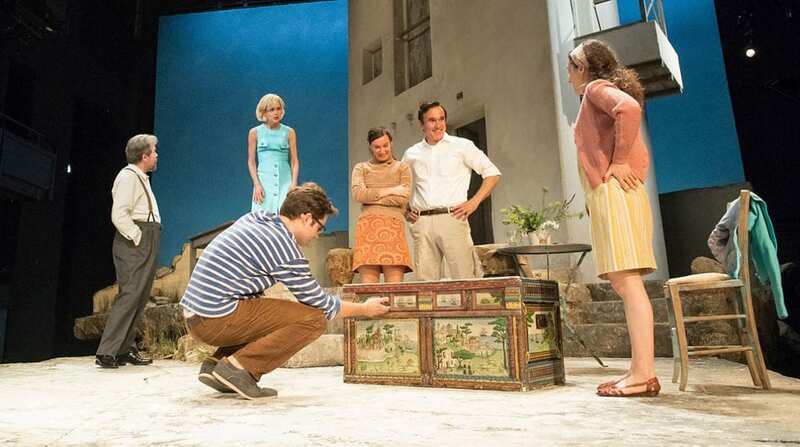 The second half of the play revisits the villa and the protagonists. The house is now smartened up and scattered with the paraphernalia of the two children born to Theo and Charlotte in the meantime, but time has not been kind to the couples. Experiences in Chile have atrophied Harvey’s neo-liberal idealism, June has taken the bottle to blot out her sorrows, Theo has had considerable literary success but lost his writerly soul in the process, and Charlotte is no longer happy with her acting career and consumed by guilt over the villa and how they acquired it. 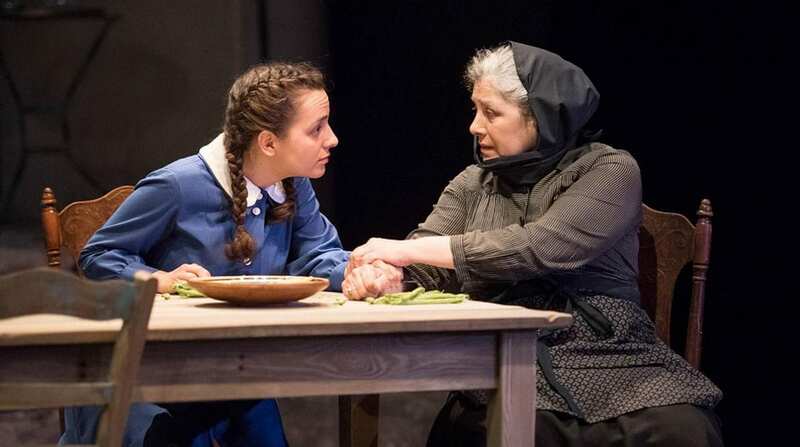 The characters are delineated in detail and there are plenty of opportunities for humour in both halves of the play based on their accumulated misunderstandings and tensions; but in many ways the play tells rather than shows in a crude ideological fashion. Lurking in the background is a critique of the European Union’s recent handling of Greek assets, but it is too remote to be made effective. At the other end of the spectrum the emotional affinities between the four characters are insufficiently detailed – we are told that Harvey and Charlotte are drawn to each other but we hardly see or feel it, any more than we grasp a possible gay sub-plot between Harvey and Theo, or the nature of the marriage between Harvey and June . In the best plays that proclaim a social conscience – like, for example, An Inspector Calls – the message is made real through the drama rather than by assuming an automatic symmetry between the audience’s perspectives and the writer’s. Here the critique of American neo-liberalism and empathy for Greece’s woes is simply too crude and undercooked to work as the author wishes. What saves the evening though is the skill of the players. McGovern in particular is an absolute comic delight, about as far away from the gowns of Grantham as you could imagine. Moreover, the sadness behind the alcoholic haze is exquisitely conveyed in one particular monologue which is really the highpoint of the evening. Miles is as magnetic an actor as ever, and does his best with the rather two-dimensional part of the bossy and unbearably ‘unquiet American’. Crane is excellent in the first half as a prisoner of conventional ‘English manners’, and Nixon carefully calibrates the stages of her disintegration and loss of self-confidence. 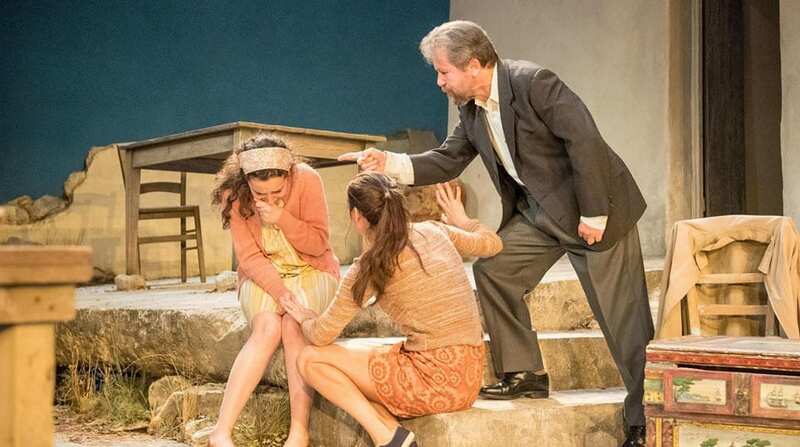 The three Greek roles provide a dignified moral counter-balance to the antics of the Westerners, and it is perhaps a dramatic loss that they do not make more of a return in the second half. This is an intriguing but ultimately unsatisfactory evening, where the importance of the themes touched on is palpable, but an effective treatment of them remains out of reach.